OWENSBORO, Ky., Jan. 9, 2019 /PRNewswire/ -- Southern Star Central Gas Pipeline, Inc. (Southern Star) is pleased to announce the commencement of a new Non-Binding Open Season to identify market growth and supply access opportunities, to quantify interest in firm transportation service, and to identify the need to construct facilities. 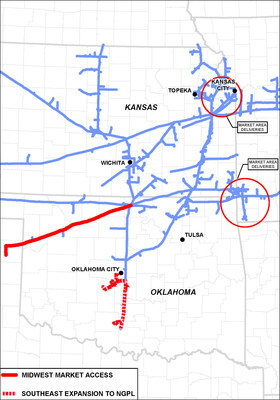 Southern Star is specifically evaluating interest in two potential projects that would provide increased connectivity, expand capacity in Oklahoma and our market area, and expand our Southeast market access through Natural Gas Pipeline Company of America LLC (NGPL). The Midwest Market Access project would provide the growing SCOOP and STACK production plays more access through Southern Star's Production area and into our Market area by adding compression at our Blackwell Station and on our Canadian Blackwell (CB) line, with the potential for additional compression downstream of the PMI in our Market area, to create up to 160,000 Dth/d incremental capacity on CB and in the Market area. The Southeast Expansion to NGPL project would expand capacity of the recently installed NGPL Carter interconnect between Southern Star and NGPL, allowing the growing SCOOP and STACK production plays more access through Southern Star to TexOk markets in NGPL's Segment 15. This expansion could provide up to 40,000 Dth/d of additional capacity. Additional information regarding the project may be obtained by contacting Robbie Clark at (270) 852-4577 or Chad Priar at (270) 852-4558. Interested parties may access Open Season information at: http://csi.sscgp.com/ under the "Notices – Non-Critical" tab in the Informational Postings on CSI. Southern Star Central Gas Pipeline, Inc. is an interstate natural gas transmission system headquartered in Owensboro, KY, spanning approximately 6,000 miles in the Midwest and mid-continent regions of the United States. Southern Star's pipeline facilities are located throughout Kansas, Oklahoma, Nebraska, Missouri, Wyoming, Colorado and Texas. It serves metropolitan areas in Missouri (Kansas City, St. Louis, Springfield, St. Joseph and Joplin), Kansas (Wichita, Kansas City, Topeka and Lawrence) and Oklahoma (Oklahoma City). For additional information about Southern Star, please visit www.sscgp.com. SOURCE Southern Star Central Gas Pipeline, Inc.